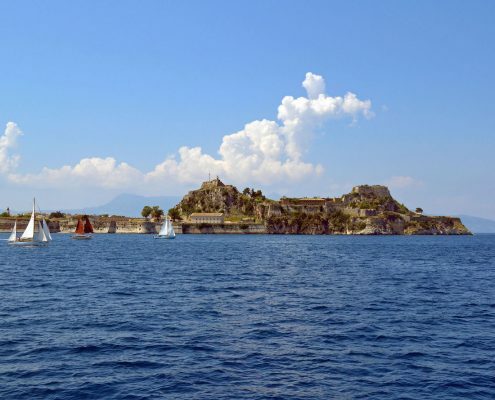 Just an easy day’s sail out of Brindisi, Greece’s Ionian Islands have the Middle Eastern atmosphere and look of the other Greece archipelagos (the Cyclades and the Sporadi) that fan out across the Aegean after the Corinth Canal. They also, however, have the distinct advantage of being far easier to navigate. 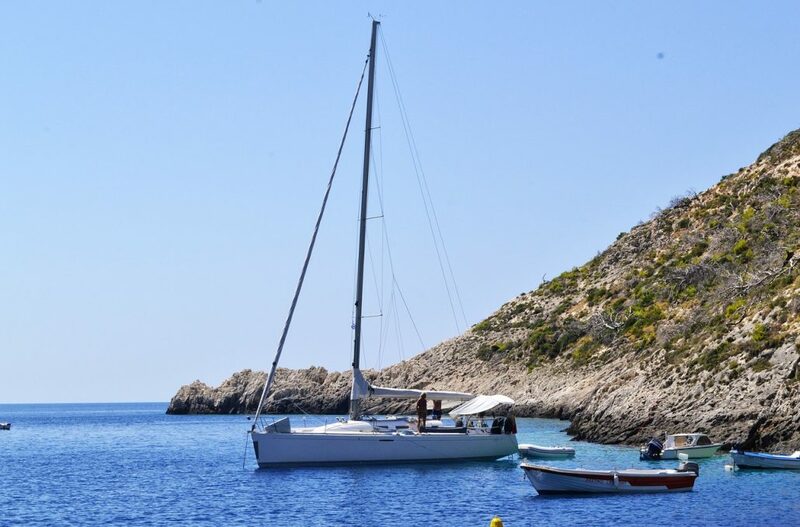 Sailing cruises in Greece, particularly in this area where the island coastlines are less jagged and the winds never strong, offer glorious laidback seafaring holidays rather than full-on upwind sailing with 30-knot Meltemis. 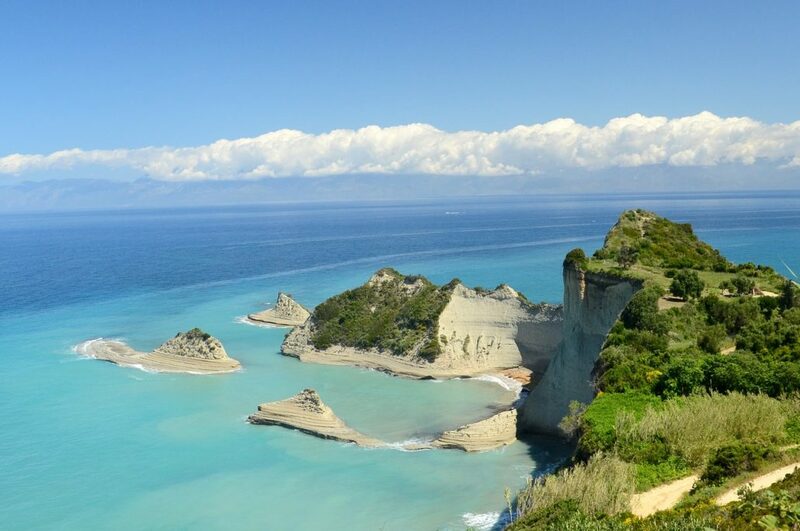 Ionian Greece is redolent of the heady perfume of olive groves and Mediterranean maquis with crickets providing a background soundtrack. Arriving there feels like coming home if you are a sailor. 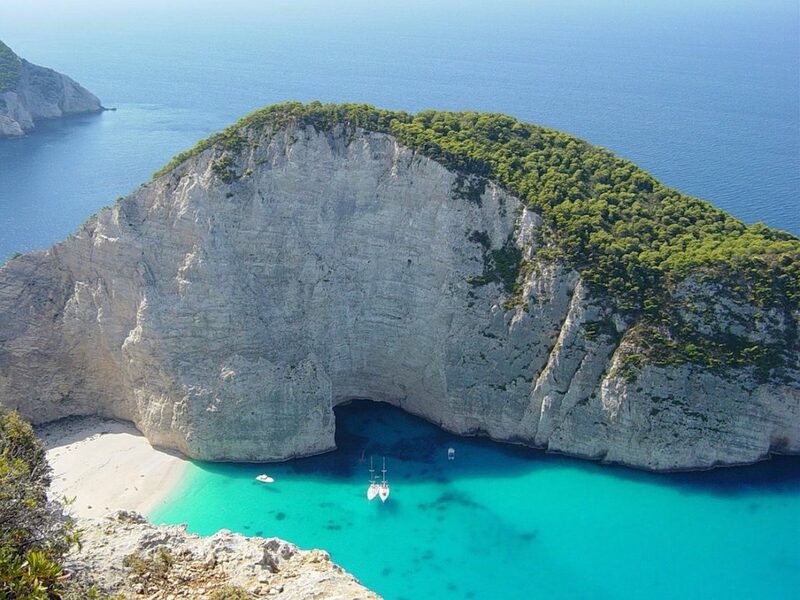 Green dominates on all of the islands and their bays glitter with myriad emerald hues. 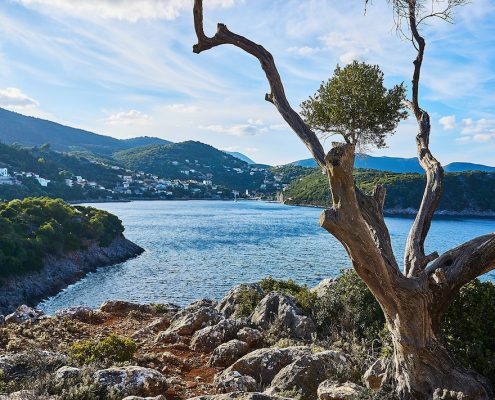 You will encounter turtles and dolphins as you swim and dive too, and be engulfed by the scent of Mediterranean herbs and brush when you venture outside of the charming and very diverse little villages dotting the islands. There is a steady but light north-westerly breeze but you won’t have to tackle the Meltemi that makes the Cyclades so challenging. The sea is calm and the climate mild. While this means, of course, that the anchorages are rarely empty, they never get too crowded either. The perfect thing to do is flit from one island to the next by day and then simply luxuriate in the almost surreal peace that falls once the sun glides below the horizon. 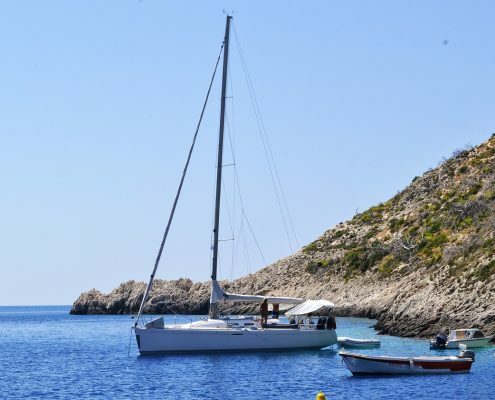 All in all, the Ionian Islands are ideal for sailing cruises in Greece, especially for anyone travelling with small children, families and crews on their first cruise. Just 20 or so of the 120 islands making up the archipelago are inhabited. 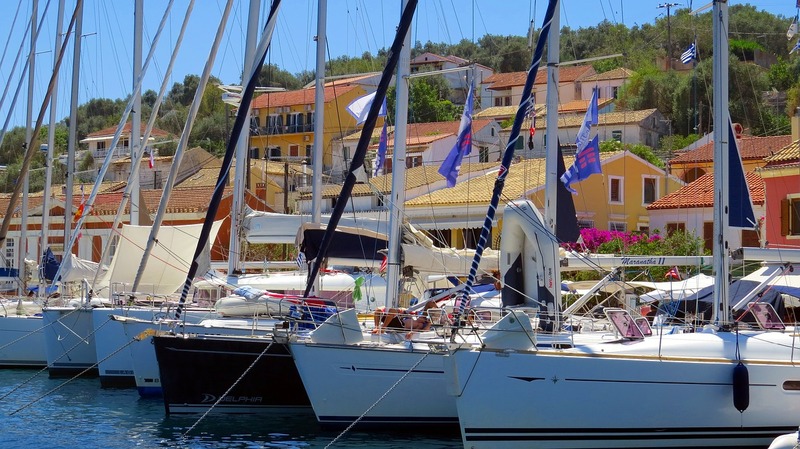 The larger have well-equipped marinas where you can not only easily fill up on water and fuel but also add a little Greece flavour to your basic provisions. You’ll adore the authentic local delights – mouth-watering honey, olives, pistachios, feta cheese and the creamy yogurt used to make saziki, a refreshing cucumber-based salsa that will crop up again and again every time you eat out. Amenities-wise, the smaller islands have little more than a tiny village to offer but are probably more worth calling to than the larger ones. 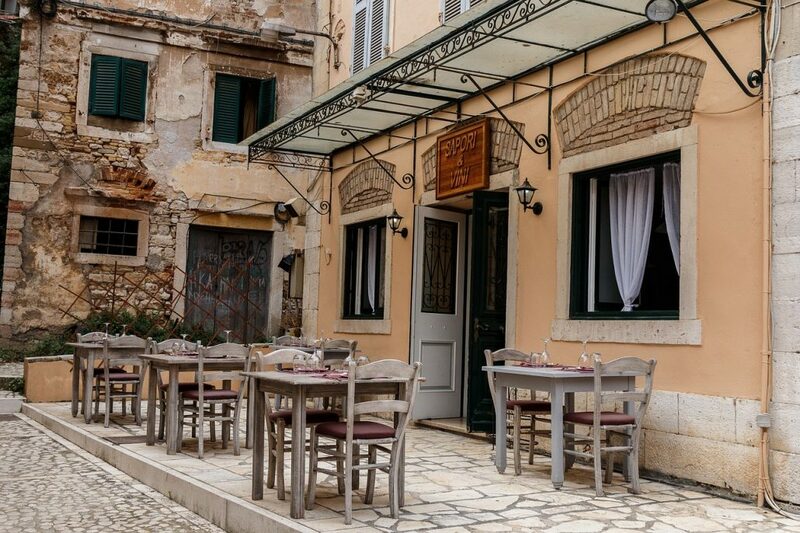 Their beauty is very person-sized beauty and there will be seashore restaurants and tiny bars where you can hang out and chat until late, listening to sirtaki playing and sipping Ouzo, Metaxa or Mastika. A genuinely old-fashioned pleasure that will make you feel light-years away from the hustle and bustle of 2018. 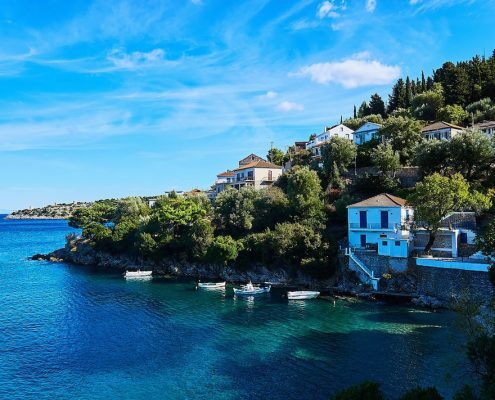 All the islands inhabited by fishing families and other seafaring folk have little ports of their own and so do down anchor for a few nights in their little coves and off their beaches to simply soak up the beauty of Ionian Greece and its unforgettable starry skies. You’ll find the nights are always peaceful and the anchorages wonderfully sheltered. 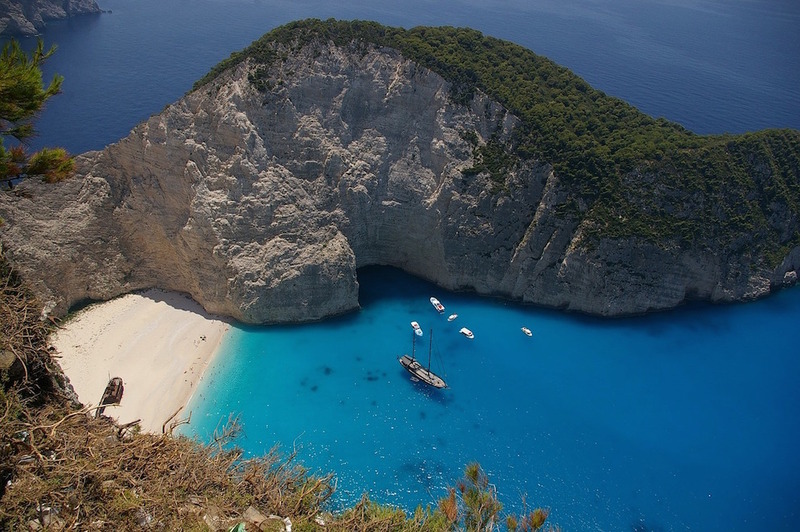 The best known of the Ionian Islands are Corfu, Paxos, Anti-Paxos, Lefkas (Lefkada), Ithaca, Kefalonia and the legendary Zakynthos (Zante). 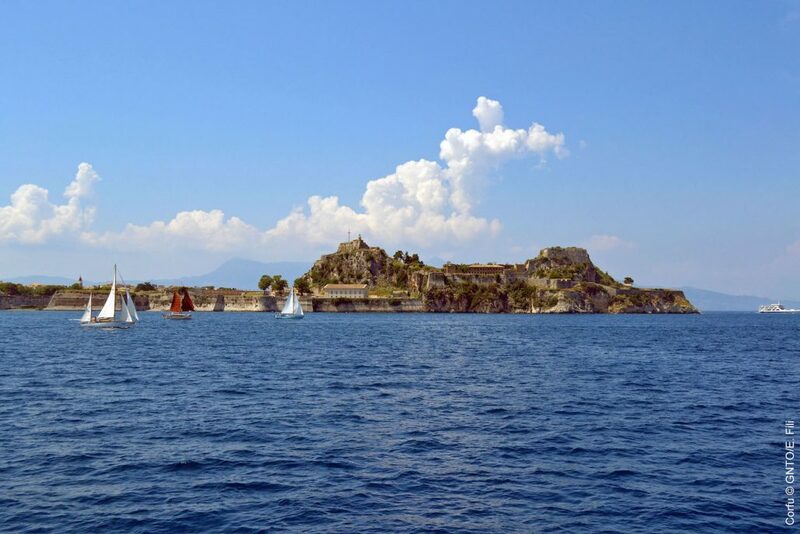 But there are many other smaller ones beside that really do merit a visit, not least Meganissi, Othonoi, Skorpio, Kalamos, Kastos and Atokos. 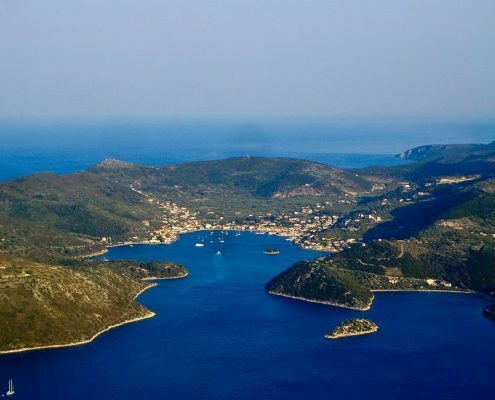 Kefalonia is the largest of the Ionians and Ithaca the most famous. 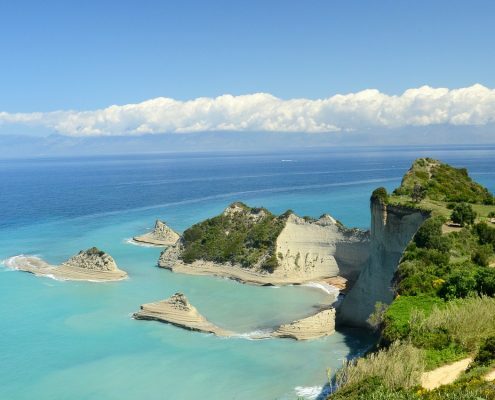 Corfu is normally where everyone starts out from and is also the largest island between Albania and Greece, separating them with a sliver of sea that is just a mile and a half across at its narrowest point. 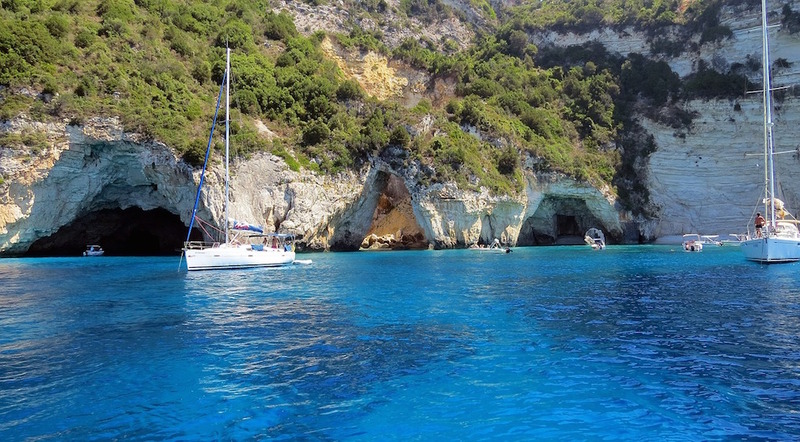 If you cast off from Brindisi or Gallipoli in Italy, it will only take a little over a night’s sail to get you to Greece. Kerkyra, as Kefalonia is known in Greek, deserves a call mostly because of its old town centre. Over the centuries, the island played host to Roman, Venetian, Turk and British invaders with each one leaving its own stamp. The stunning fortified city of the Knights of Malta dominates the landscape. 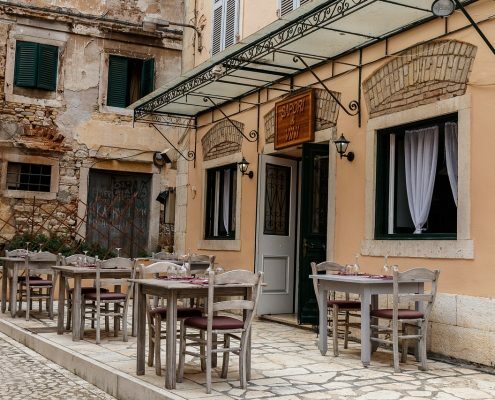 It goes without saying that the island has a bustling nightlife and the superb cuisine served up by excellent mix of luxury restaurants and more humble but equally delicious tavernas make it very tempting indeed. 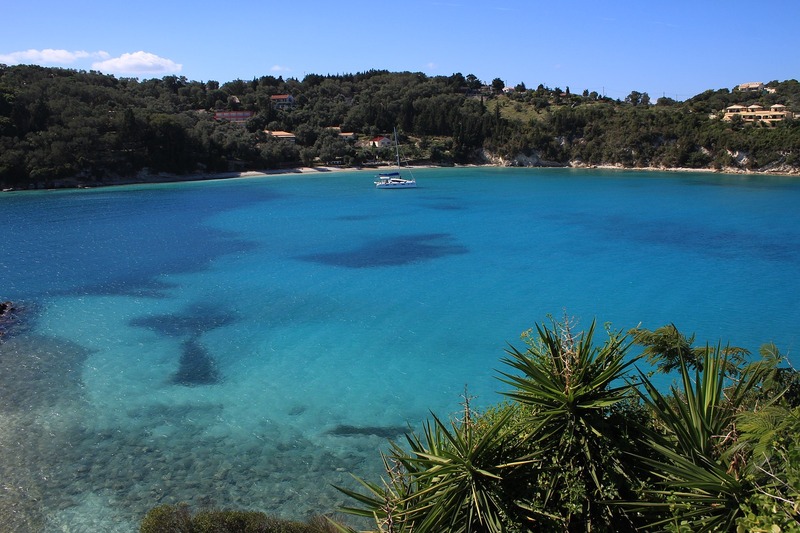 Just 33 miles, half a day’s sailing or less, separate Corfu from neighbouring Paxos which is similar in shape to a cuttlefish bone. 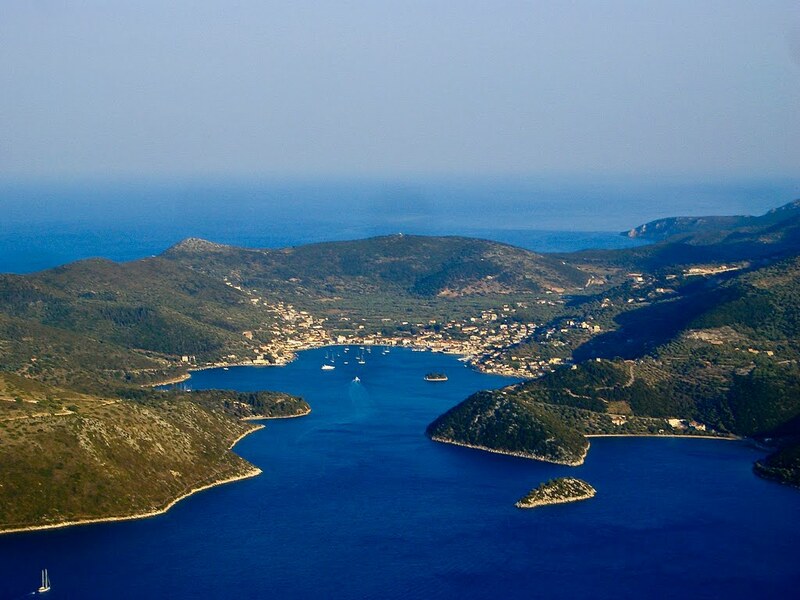 According to Greek mythology, Poseidon cut this island off from the mainland with a trident to create a love nest for himself and his wife, Amphitrite, hence the legend that the northernmost Ionian Islands were where the gods came to rest. 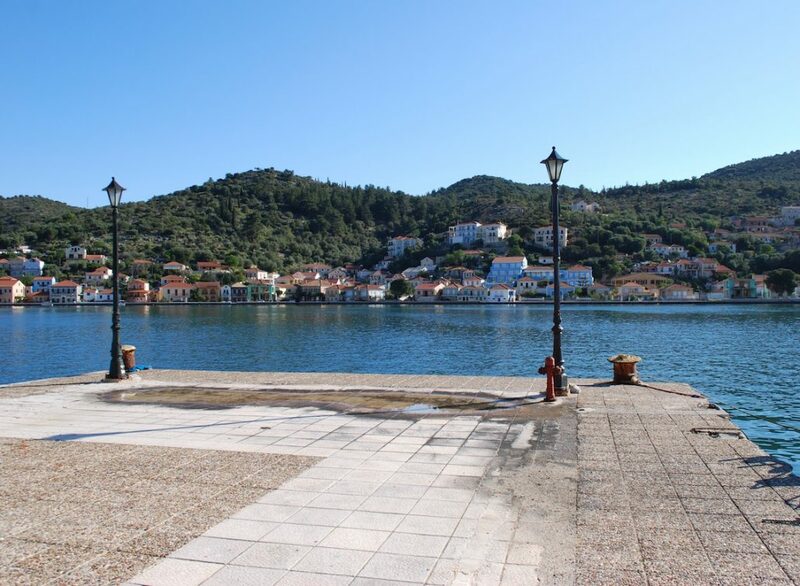 The long waterfront in the little town of picture-perfect houses is the real heart of the island. Tiny restaurants, small tourist stores and bars are strung like pearls along it and absolutely buzz with life and merriment. If you like a chic vibe then this is the port for you. 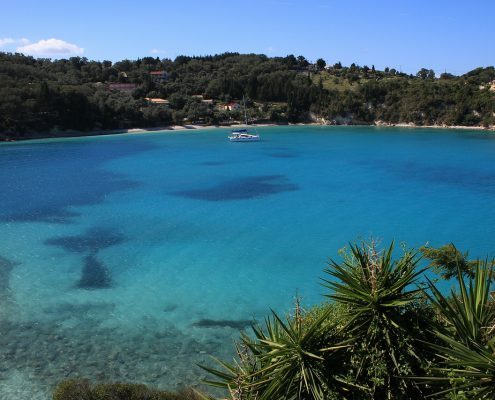 There is, however, an entirely different world from the trendy bustle of Paxos just mile and a half away on the tiny and extremely unspoilt Anti-Paxos. There peace reigns supreme. Just 50 or so Greeks are resident during the summer and their number drops just 20 in winter, in fact. We suggest arriving at sunset and downing anchor off the little village’s eastern bay where the water is breathtakingly clear, and then casting off again when the first tourist boat arrives to break the spell. 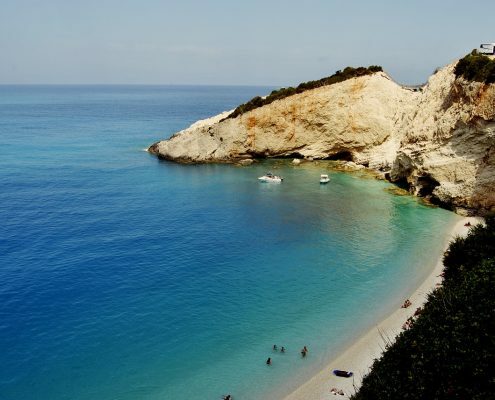 Lefkada, 30 miles further south, is also worth a visit and there is a very good reason why. The wind there is a little brisker and so will reward you with some great, fun sailing. The island’s proximity to the mainland is also unusual – it is separated by a manmade canal and so you’ll negotiate swing bridges and coastal sand bars, making it a little adventure within an adventure. Lefkas has a port with plenty of amenities and a large town where you can shop to your heart’s delight, treat yourself to a gourmet supper or stock up in European-style supermarkets before heading on to the more southerly islands where the small local shops will only sell basics such as fresh fruit and vegetables, feta cheese, olives, yoghurt and pitta bread. 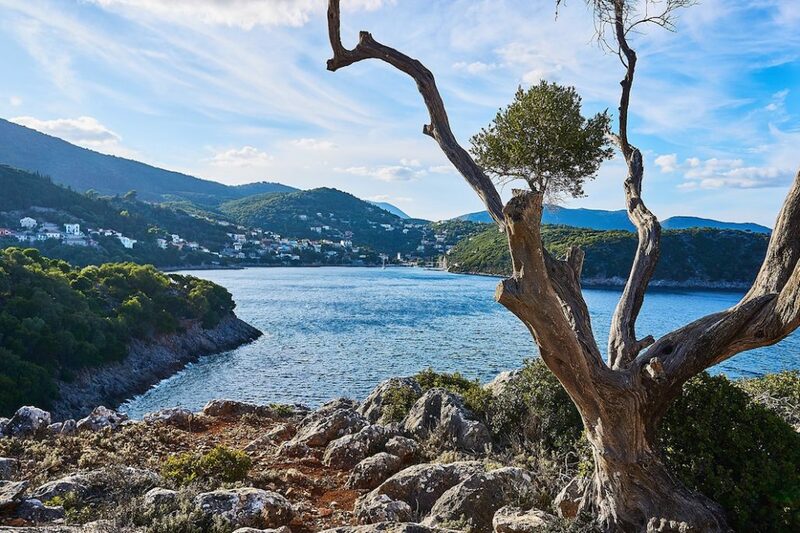 If you set a route south, you’ll come upon Venetian castles of the likes of the one at Assos, which enjoys a spectacular position on Kefalonia, and areas where time seems to have stood still. 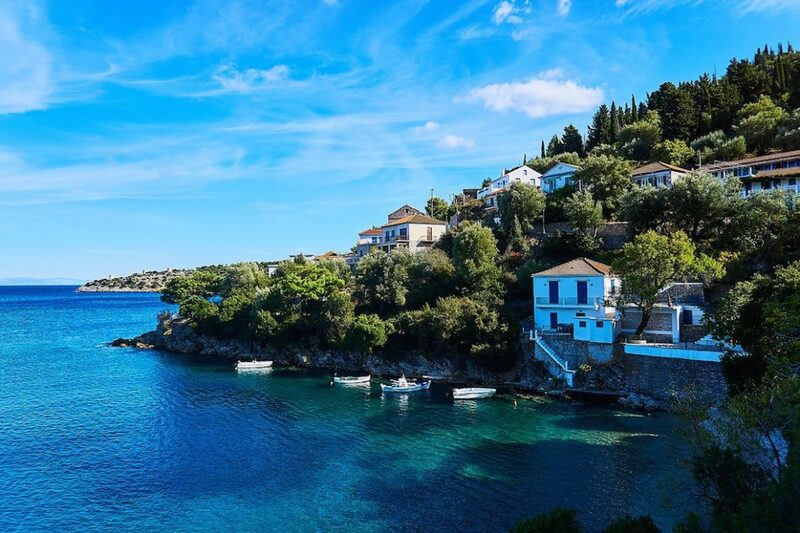 A good example of the latter is Ithaca, the birthplace of Ulysses, which is also probably one of Greece’s most beautiful islands thanks to gorgeous beaches immersed in wild natural surroundings. 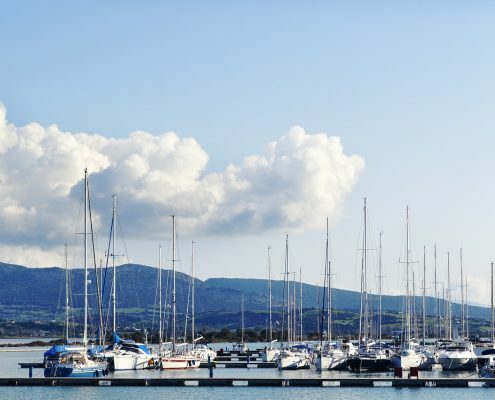 Vathy, the capital, has one of the largest and most stunning natural bays in the world. But you should also take in Perachori, Kioni or Frikes too. 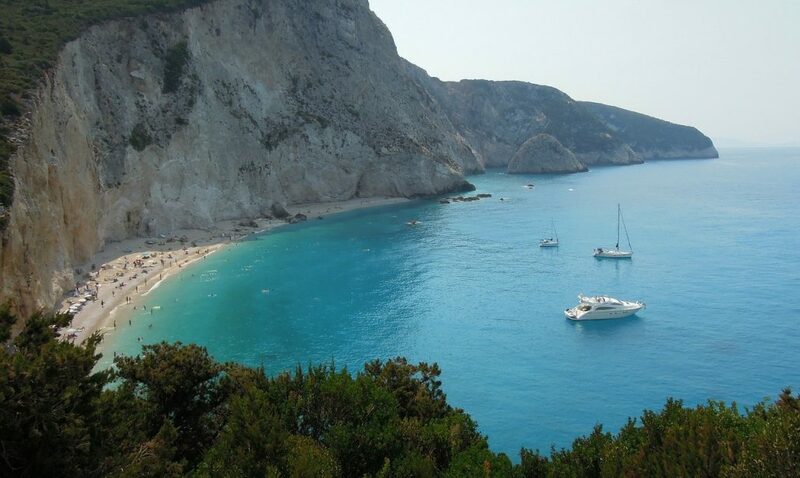 More delights await on Zante or Zakynthos. 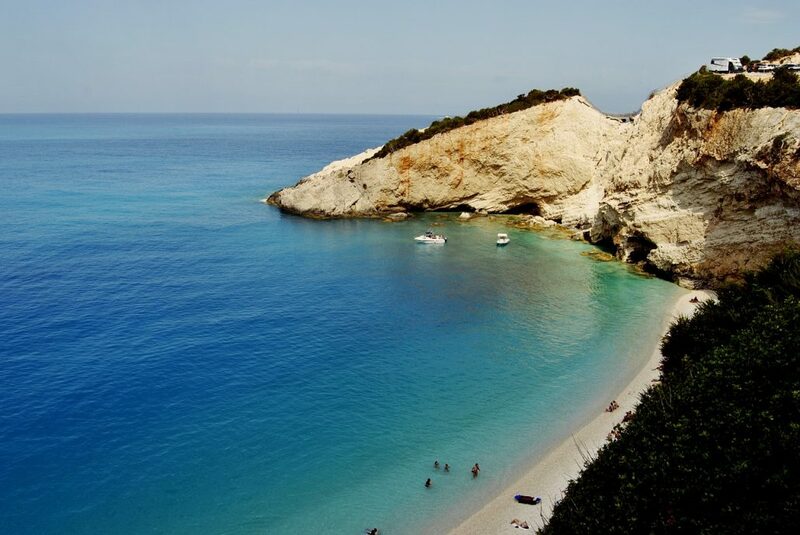 The island’s Lagana Beach is, in fact, where the caretta caretta sea turtles return each year to lay their eggs. 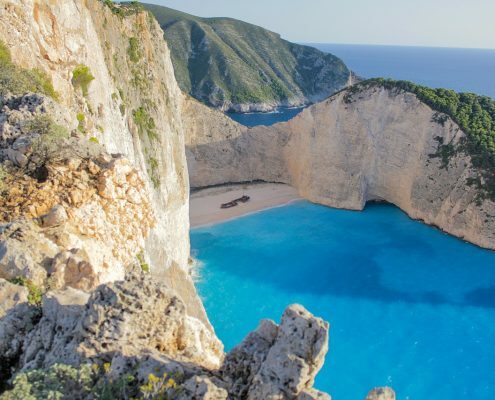 Nature, history and poetry are the leitmotifs that run through all sailing cruises in Greece, particularly those in the Ionian Islands thanks to their sandy beaches, ancient villages and magical areas such as Navagio or Shipwreck Beach on Zakynthos, a real favourite with sailors as it is only accessible by sea. 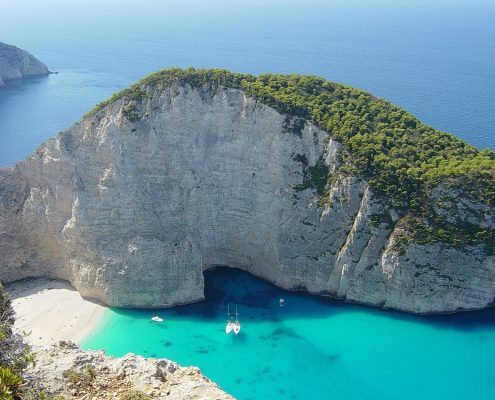 One of the most stunning beaches in the whole of the Ionians, it is famous for the wreck of the MV Panagiotis, a freightliner laden with contraband tobacco which ran aground on its white sandy shores in 1980. 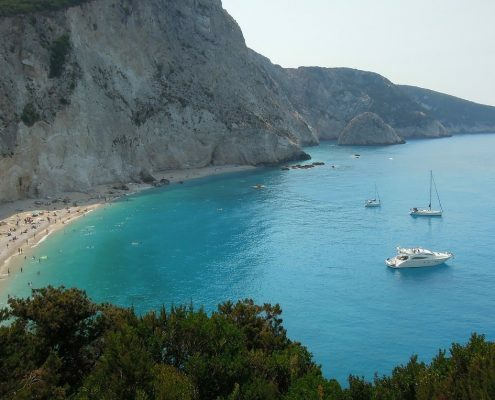 These days it is a favourite with sailors who love diving into the clear seas there in early morning after spending the night at anchor in a roadstead that keeps its beauty for the privileged few after sunset. 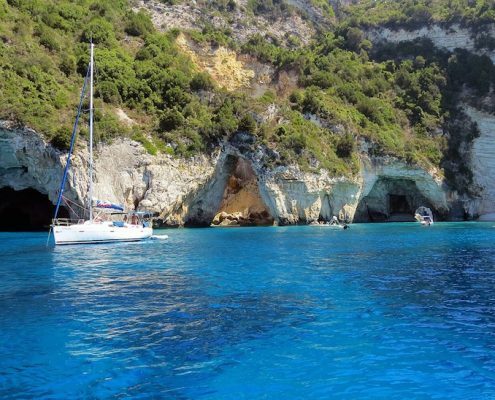 When it comes to sailing cruises in Greece in general and the Ionian Islands in particular, Equinoxe Yachts has plenty to offer both clients looking for a crewed charter yacht and those wanting to sail independently and charter a sailing craft with or without skipper. 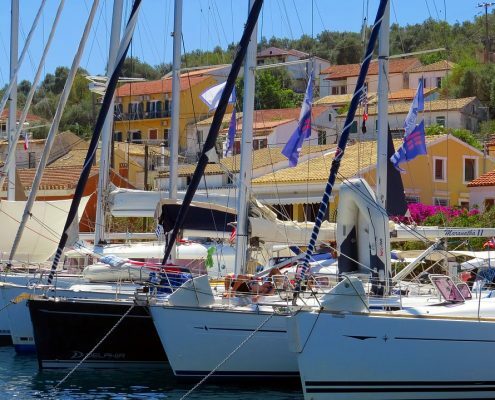 In the first instance, one of the stars of the Equinoxe Yachts fleet has to be Sea Prince, an elegant 25.5-metre motorsailer clothed in classic lines. Built by the legendary Abeking & Rasmussen and fully refit in 2017, the yacht offers four two-berth en suite cabins sleeping a total of eight guests and a crew of four comprising a captain, sailors and a hostess. If bareboat is your bag, Equinoxe can also you steer you towards the best on the market. The Sunsail and Moorings fleets, which are based on Corfu and Lefkas, have a great choice of sailing monohulls and catamarans of between 12 and 18 metres. Obviously we can also provide skippers familiar with the area who delight in revealing its secrets. 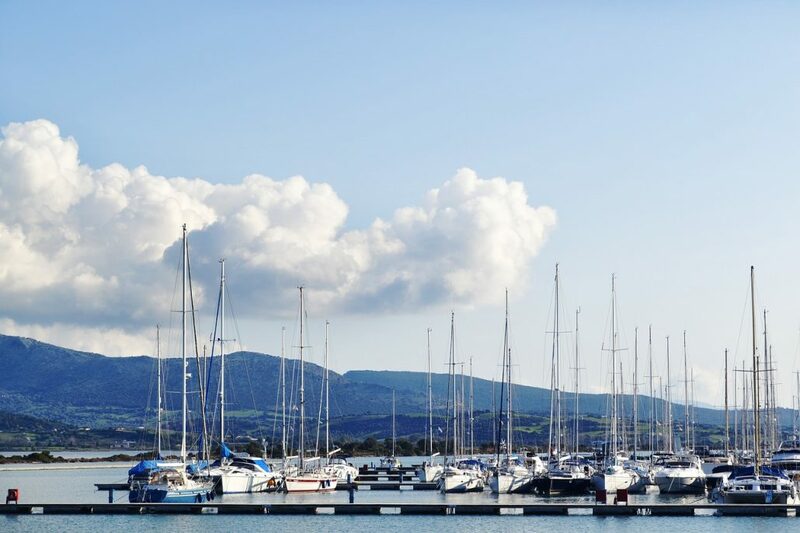 Equinoxe regularly visits its boats to guarantee that they are impeccably maintained and also that the crews are up to standard. 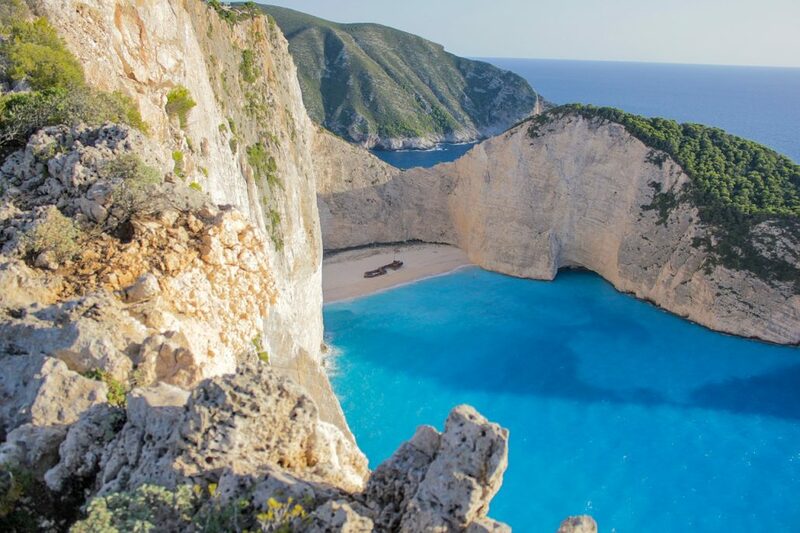 Crewed Charter Pontine Islands Caribbean Cruises – and why not take in the Tropics too!